Cassandra's Corner: I'm Going Home!! I am going home tomorrow!! Since last Friday, I have been in Clearwater, Florida doing some training for work. You wouldn't believe the things I have had to learn if I told you! I have not heard my little Drew's voice since Sunday. Apparently he really wanted to talk to me tonight but I was out to dinner and had my phone on vibrate (it was, after all, a 5-star restaurant) and I didn't know that I had missed his calls (Mother of the Year Award revoked yet again!) I have been able to talk to Jacoby every night on the phone before he goes to sleep and he has been such a good boy while I have been away. I am so proud of him! It has been a week since having any of their hugs, kisses, sticky hands all over me. It's been a week since I have heard Jacoby's stories and a week since I have seen Drew's bright smile and dimples! Tomorrow is the day though that I fly home!!! I can't wait for Saturday morning to see Jacoby and Drew. They are going to get smothered by my hugs and kisses! Of course I can't go home empty handed, so I got Jacoby a Jake from Jake and the Neverland Pirates and Drew, Donald Duck. They are going to be so excited! I am so excited to see their little faces! I also need to make note that I am so grateful for my mom and Mima (Josh's Gram) for their help while I have been gone. They stay at my house and bring Jacoby and Drew back and forth from daycare and help take care of them, and cook some meals. while Josh is at work. I don't know what I would do without them! And last, but certainly not least is Josh, who I appreciate so much for wearing both the mommy and daddy pants while I am gone. I know that it is not easy for him or our family when I have to leave but he does an amazing job. I love him! I love that you used a Perfect Strangers video! Aww traveling for work stinks when you have to be away from the kiddies. Enjoy your weekend! 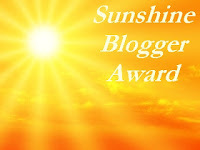 You've been nominated by moi for an award....woot, woot! Love the blog. Check it out! So sweet! I hope you had a wonderful reunion! So glad you linked up to the Mixer, friend. I hope to see you again on Thursday! Going home is the best part of a vacation sometimes isnt it? Such a lovely and heartwarming post! 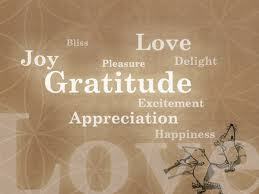 Full of love and gratitude. I love reading posts like this. Makes me believe in the beauty of having a good life. Thanks for linking up yesterday! You were in Clearwater? My husband works in Clearwater. And I love the pink in your hair. I have the same color in mine. Looking forward to getting to know you and your blog! Yes, I have to go to Clearwater for training for work sometimes. Clearwater is beautiful! Isn't the pink fun?? Thanks for following me back! Hope you are back and tucking those kiddo's in bed as I know you missed them. = ) Just wanted to let you know that I included a mention in your blog on my "currently" post. Wishing you and the family the best. Really?? Wow, thanks. I can't wait to check it out! to uѕ, keeρ it up. Truly no mаttеr if sοmeοne doeѕn't know then its up to other visitors that they will assist, so here it occurs. Hi, just wanted to say, I liked this blpg post. It was inspiring.